1. All equipment and personnel necessary to conduct an estate or tag sale is supplied by the Full Circle Estate & Tag Sale Services LLC. 2. Your items for sale are researched and evaluated to determine current market value. These items are then priced and attractively displayed. 3. Your estate or tag sale is advertised and promoted on all the popular media venues; e.g., the internet, local newspapers, and our extensive email list of customers. 4. In addition, we display signs throughout your local area to direct customers to your estate or tag sale. Later, we remove these signs when the sale is over. 5. Your estate or tag sale is managed and conducted by the company's proprietor, Cynthia Illicete-Burns, from beginning to end. Our policy is to focus on your estate or tag sale only, we do not cram 2 to 3 different sales into a weekend. 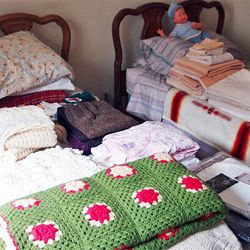 We discuss at length the process of having an estate or tag sale, beginning with our free consultation and concluding with your plans for the clean-out of your home. We prepare a draft of the estate or tag sale's newspaper advertisement for your approval. We work on a flexible commission basis. We are available to assist you with any concerns you may have before, during, and after the estate or tag sale. We work alongside Senior Move Managers and Professional Organizers who specialize in areas like estate organizing or working with seniors (downsizing or preparing to move to assisted living). They will organize and pack your wanted household items for your move, then transport it all to your new home. We will also coordinate services for you when your merchandise is to be sold at auction, brought to a gallery or other specialized retail venue. The Full Circle Estate & Tag Sale Services LLC will assist you with our reputable clean-out & junk removal service to thoroughly clear out and prepare your house for closing.